The 1988 Chicago Cubs season was the 117th season of the Chicago Cubs franchise, the 113th in the National League and the 73rd at Wrigley Field. The Cubs finished fourth in the National League East with a record of 77–85, 24 games behind the New York Mets. The first game under lights at Wrigley Field was on August 8 (8/8/88), against the Philadelphia Phillies. With the Cubs leading 3-1, in the middle of the 4th inning, a powerful thunderstorm rolled in. The game was suspended, and finally called at 10:25PM. 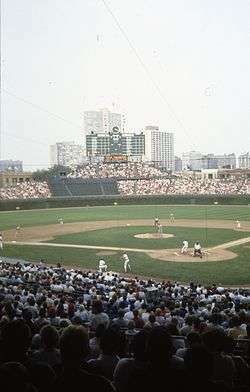 Since the rules of Major League Baseball state that a game is not official unless 5 innings are completed, the first official night game in the history of Wrigley Field was played on August 9, when the Cubs defeated the New York Mets 6 to 4. A ticket from the game where Cubs' reliever Goose Gossage earned his 300th career save on August 6, 1988. October 23, 1987: Dickie Noles was returned to the Chicago Cubs by the Detroit Tigers as part of earlier loan. December 8, 1987: Lee Smith was traded by the Chicago Cubs to the Boston Red Sox for Al Nipper and Calvin Schiraldi. December 14, 1987: Vance Law was signed as a Free Agent with the Chicago Cubs. February 12, 1988: Goose Gossage was traded by the San Diego Padres with Ray Hayward to the Chicago Cubs for Keith Moreland and Mike Brumley. March 31, 1988: Mike Bielecki was traded by the Pittsburgh Pirates to the Chicago Cubs for Mike Curtis (minors). 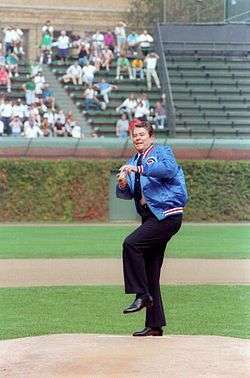 President of the United States Ronald Reagan threw out the ceremonial first pitch on Opening Day. After 5,687 consecutive day games played by the Cubs at Wrigley, the lights were finally lit on August 8, 1988, for a game with the Philadelphia Phillies. The game began before an announced crowd of 39,008. The Cubs were leading 3 to 1 and coming to bat in the bottom of the fourth when the rain delay began. The umpires called the game after waiting two hours, ten minutes. The Cubs played the first official night game the following night against the Mets and won, 6-4. July 15, 1988: Jim Sundberg was released by the Chicago Cubs. ↑ "Tiger-Cub Trade Even!". Toledo Blade. October 24, 1987. p. 16. ↑ "Rain halts night debut for Cubs". Toledo Blade. August 9, 1988. p. 17. Retrieved September 19, 2011.